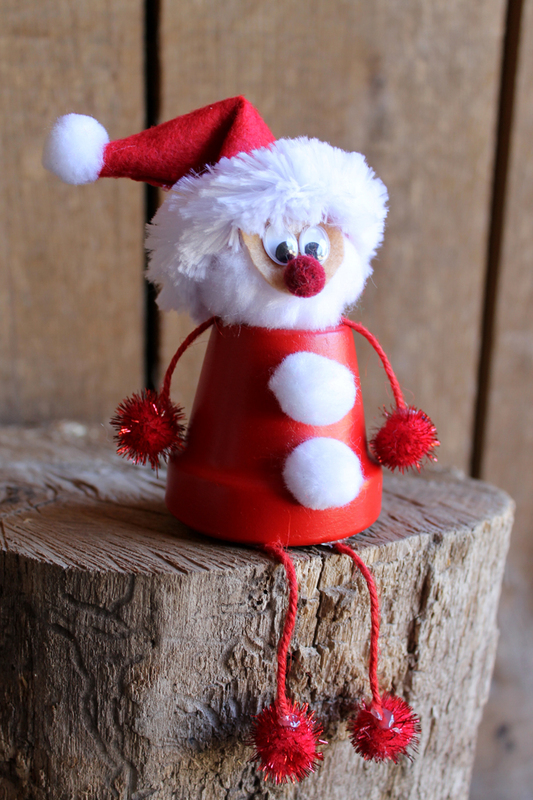 I am in love with this little terra cotta Santa craft and I think you will be as well! Terra cotta clay pots are inexpensive and perfect for crafting. You can turn them into just about anything. 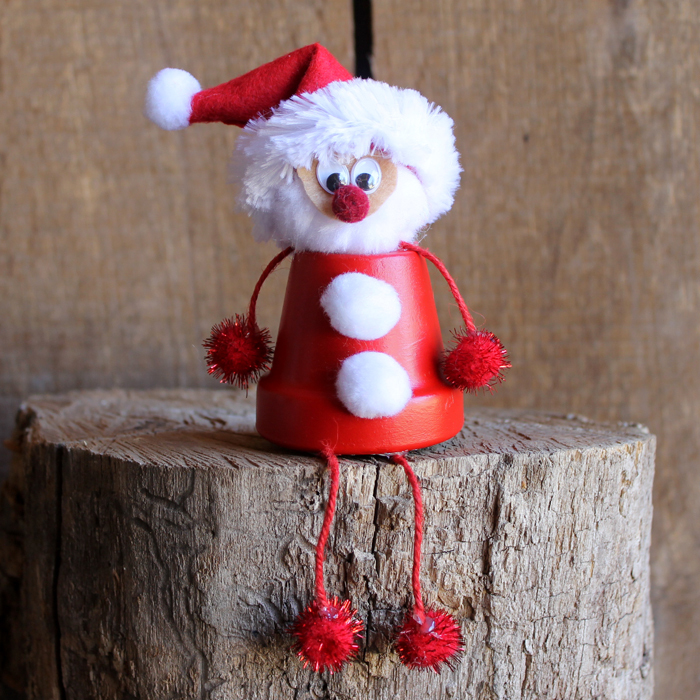 I used one to create this fun Santa that is perfect for your Christmas decor. 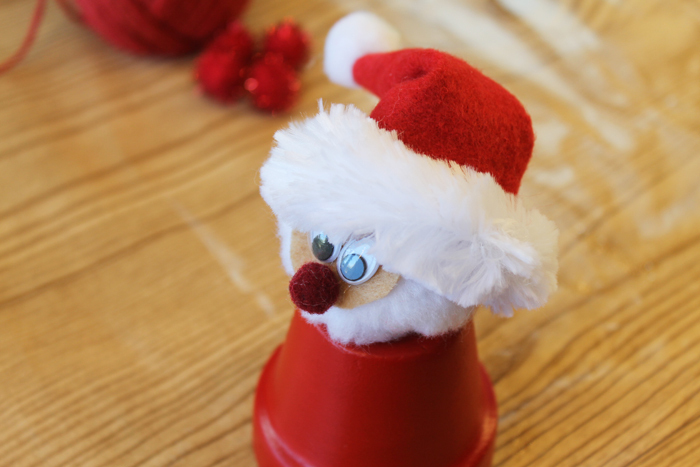 The kids will love helping to make this super simple craft idea. Links below may be affiliate links which means that you do not pay anymore but a portion of your purchase will help to support this site. 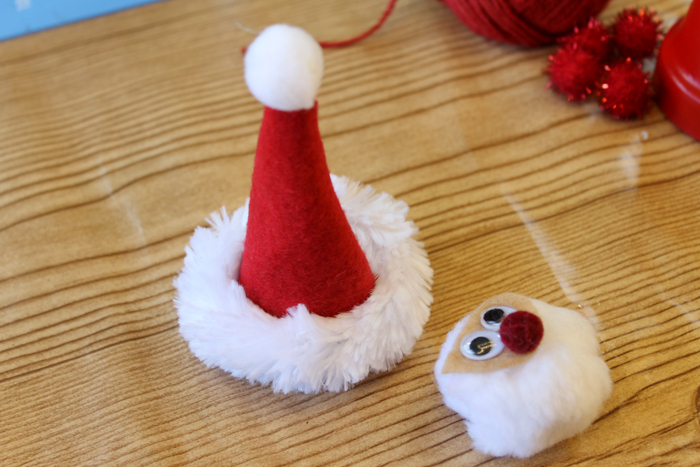 Start by making Santa’s head with the large white pom pom. 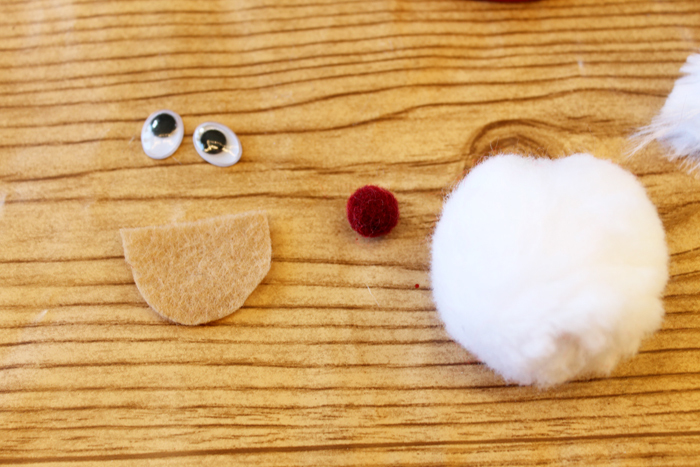 Cut out a face shape from the skin tone felt (as shown below). 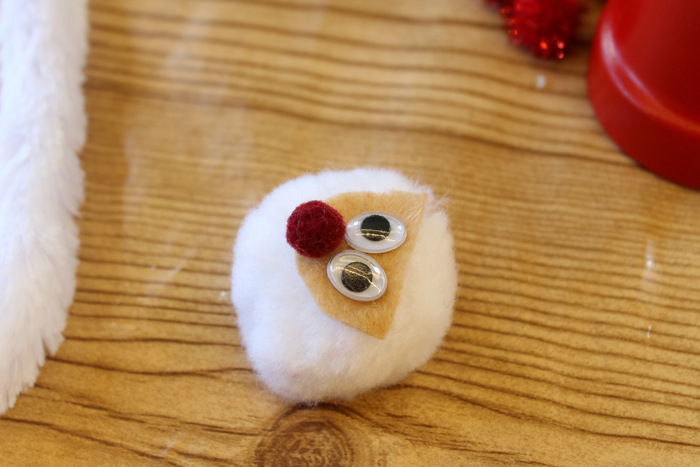 Make the face on the pom pom using hot glue to secure. 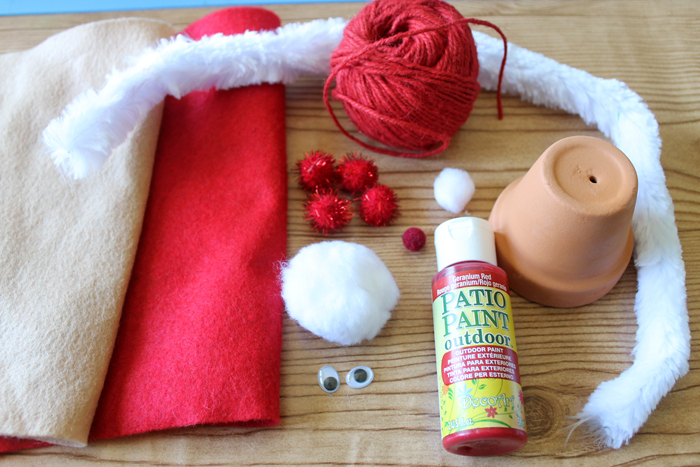 Make Santa’s hat with a piece of red felt, a white pom pom, and a large white pipe cleaner. Roll the felt into a hat shape and trim with scissors. 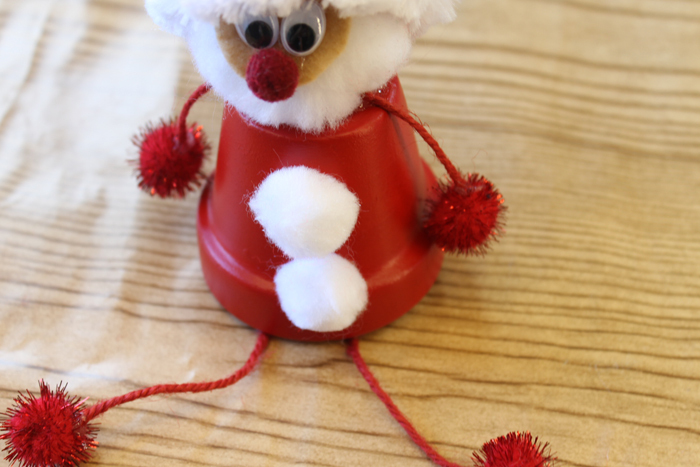 Secure with hot glue and put the white pom pom on top. 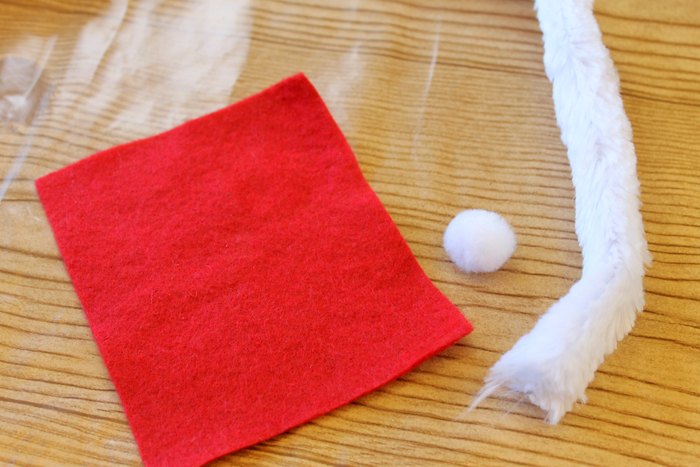 Add the white fur trim with your pipe cleaner. Secure with hot glue. 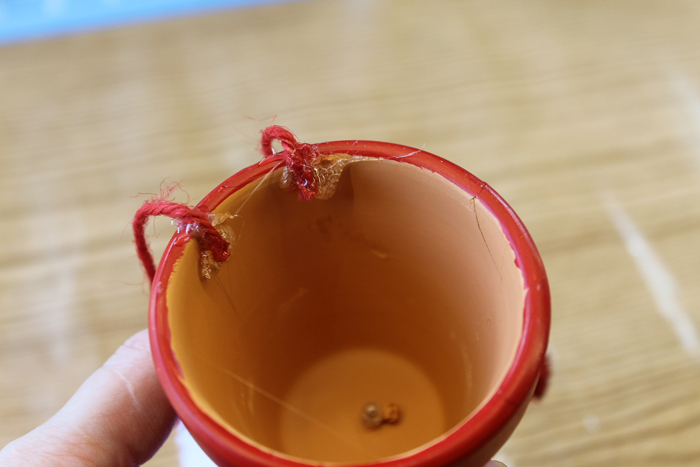 In the meantime, paint your terra cotta pot with red paint. Patio Paint makes quick work of this and often one coat is all that is needed. 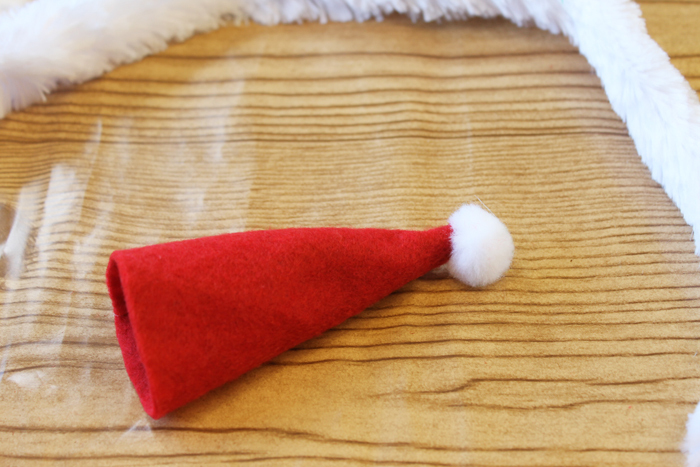 Once dry, add on your Santa head and hat with hot glue. Cut arms and legs for your creation from the red twine. The legs should be longer than the arms. Add the arms to the clay pot as shown below. Add red pom poms as hands. The legs secure to the inside of the pot as shown below. 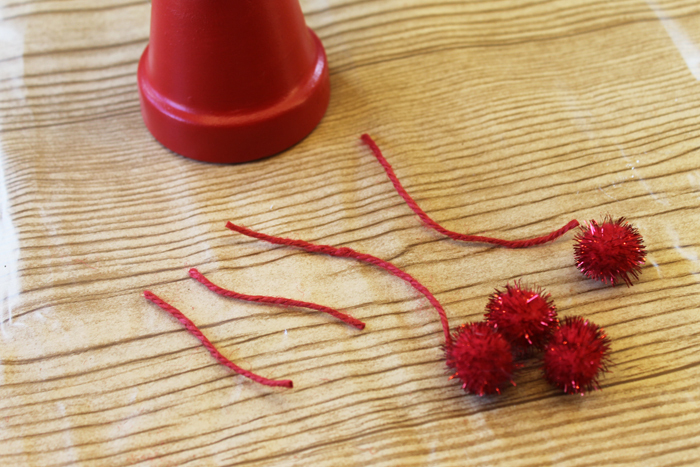 Add feet to the ends of your red twine legs. I also added a couple of medium sized white pom poms to the front as buttons. 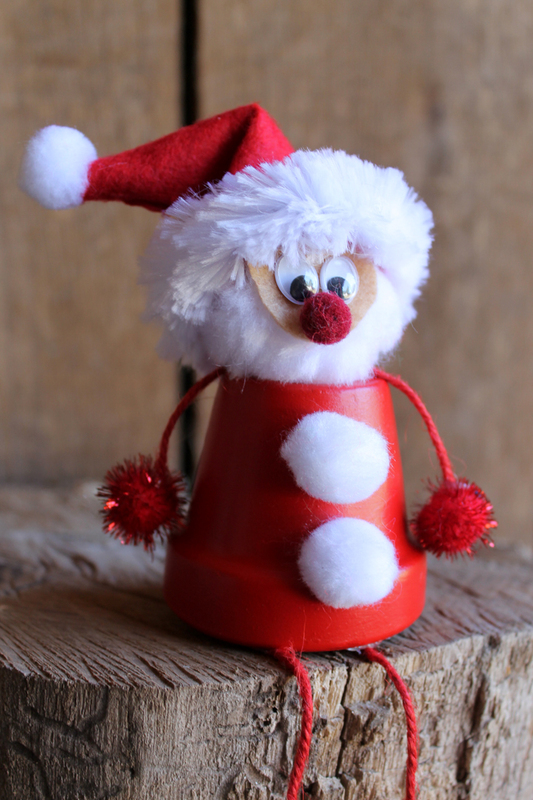 This terra cotta Santa craft if ready for your Christmas decor. I think he is just adorable and I can’t wait to add him to my Christmas mantel. He would also look great on a shelf with those little legs dangling. 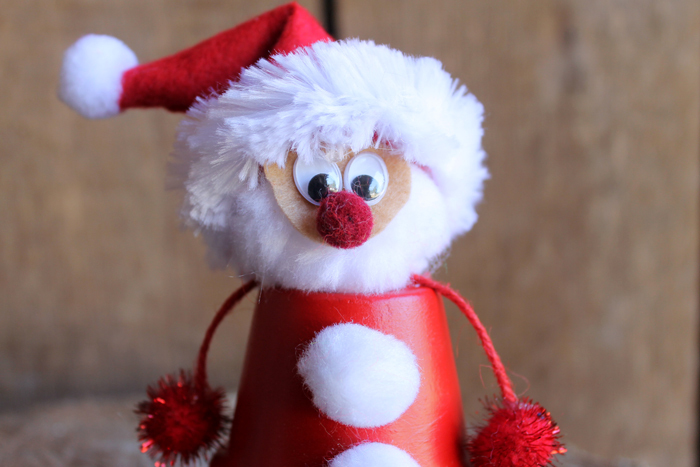 Your kids will love to help with this fun Christmas craft idea. 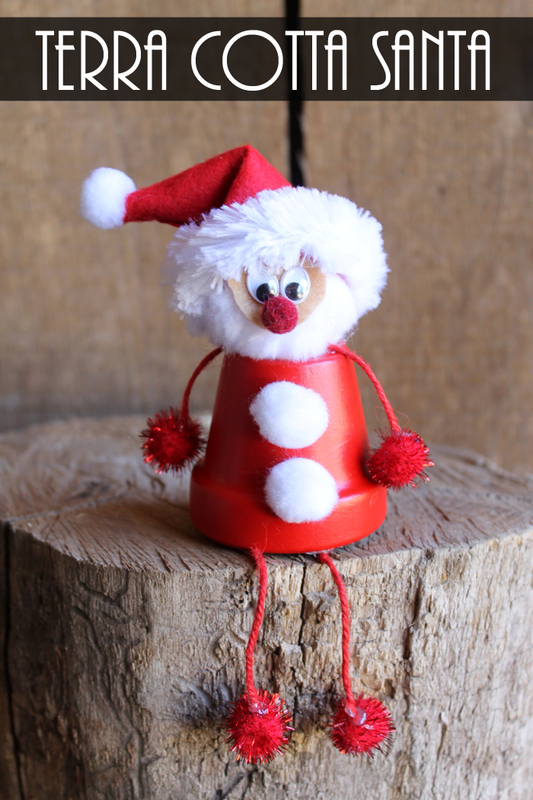 Add this terra cotta Santa craft to your must make list this holiday season. Love this and want more ideas with terra cotta pots for Christmas? 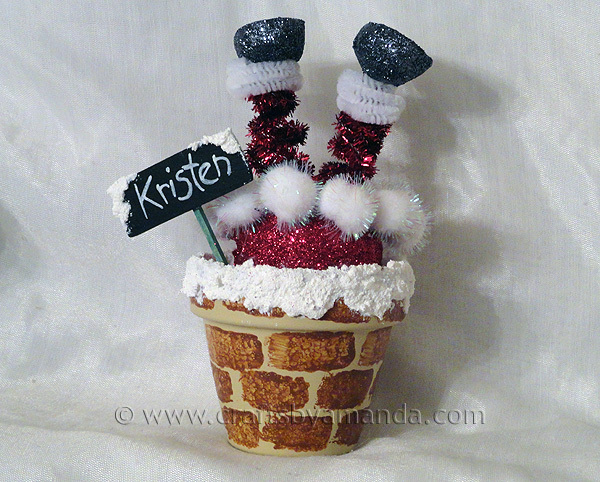 Try this fun Santa chimney place setting! previous post: Grinch Mason Jar – Make your Own! 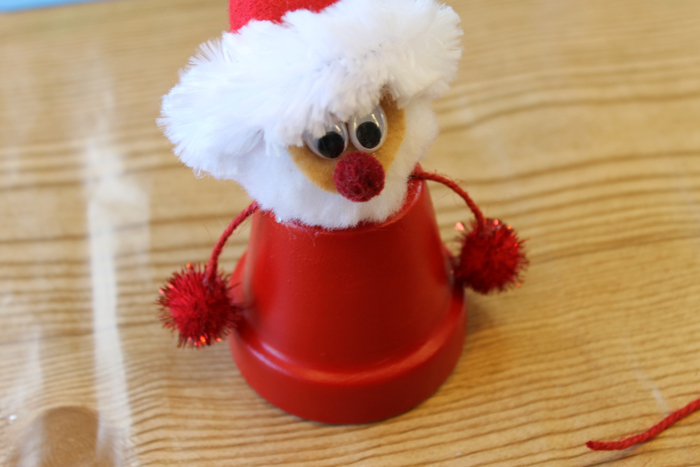 if you used a red solo cup, he could be an awesome classroom activity and then be light enough to be a tree topper! A lot of possibilities here! This is such a cute decoration! That is SO sweet! You could make other characters in the same way I guess – maybe and elf on the shelf if you painted the pot green. He is so cute, what a lovely festive idea. Pom pom all the things! Well he is adorable!Thanks for linking up to Merry Monday! Sharing on G+! Have a great week!